MoviePass is changing its prices once again. Starting in January, the embattled movie subscription service will offer a three-tiered subscription model, the company announced Thursday on its website and in an email to subscribers. The “Select” plan allows subscribers to watch three movies per month from a limited selection, excluding opening weekends, with plans starting at $9.95/month, prices depending on geography. The next level, “All Access,” provides access to all movies and showtimes for three movies per month, starting at $14.95/month. “Red Carpet” includes one “premium screening” (i.e. 3D, IMAX) per month and starts at $19.95/month. In August 2017, MoviePass slashed the price of its movie-per-day service to an unbelievable $9.95/month, and has since taken on a number of changes to this (huge surprise) unsustainable model. Over just a few months in this year, the company has introduced surge pricing, took out a $6 million loan simply to resume operations, raised monthly rates to $14.95, limited subscribers to three movies per month and, recently, reactivated the accounts of users who had already canceled their subscriptions. 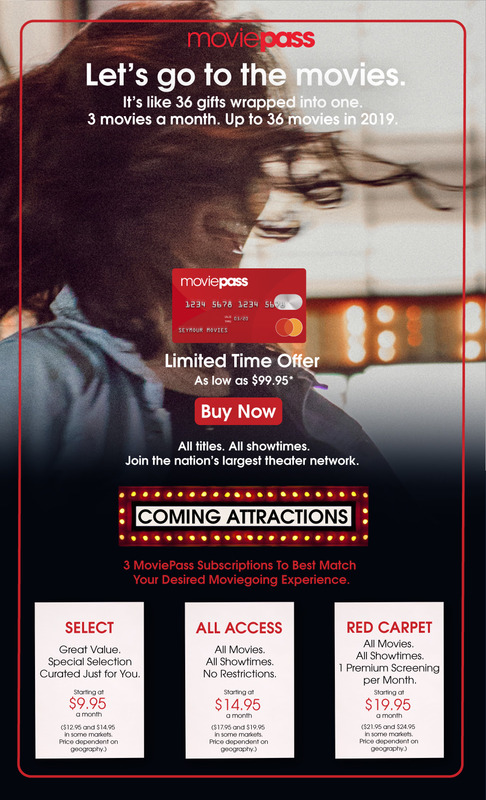 Meanwhile, many of those MoviePass subscribers who were able to cancel have since jumped shipped to AMC A-List, which allows subscribers to watch three movies per week for $19.95. A-List, run by the largest theater chain in the U.S. picked up 175,000 subscribers in its first five weeks, although that service recently announced a regional price increase of its own. It’s unlikely that MoviePass’ latest move will be enough to sway many users back to the service after its troubled 2018. Still, for those who still care, hopefully it’s enough to keep the dream alive.